John Hill is now officially an "openly gay actor"
I've come back (good news to those who missed me, and I know there are a few of you) because Bare's John Hill talks openly about being gay (for the first time I believe) in Wayman Wong's latest The Leading Men colum. It's a great read! 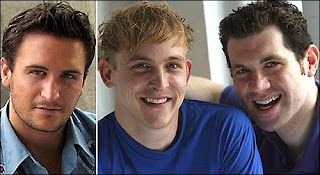 And Wayman also profiles Robin Taylor & Billy Eichner of "Creation Nation," who are also openly gay! Thanks again to Wayman for spotlighting New York's brightest talents, and for making his subjects so comfortable about talking about themselves. And bravo to John Hill!! !